This is quite an original puzzle by Siebenstein-Spiele. 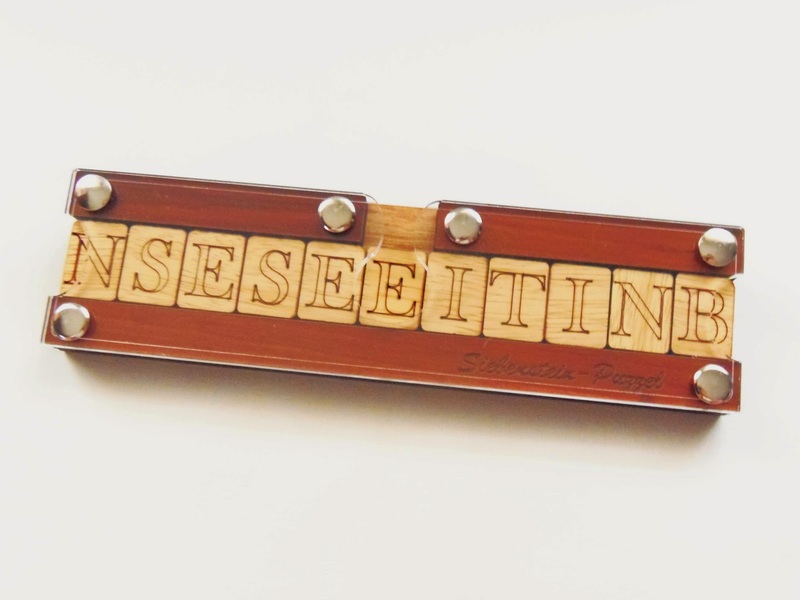 They've created a puzzle in the shape of a desk name plate with the company name. 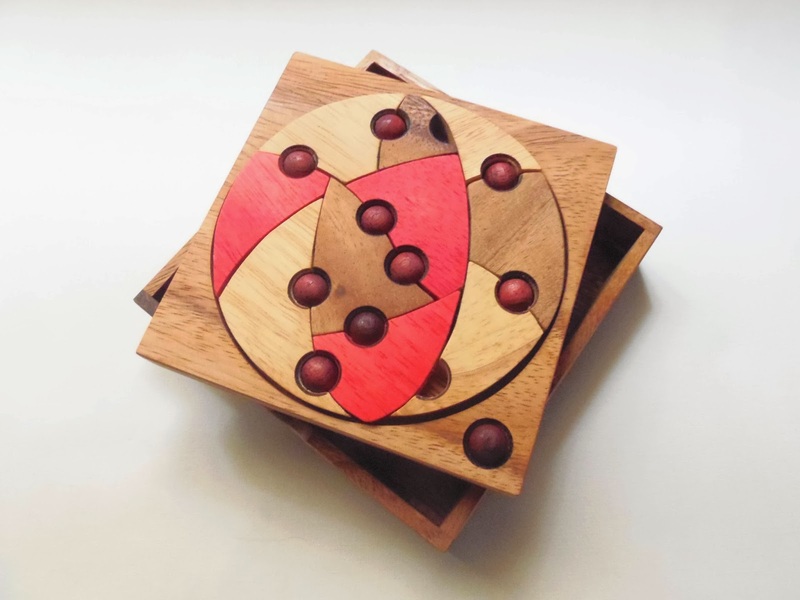 Jürgen Reiche, who comes up with most of their designs, created this unusual but very interesting puzzle. 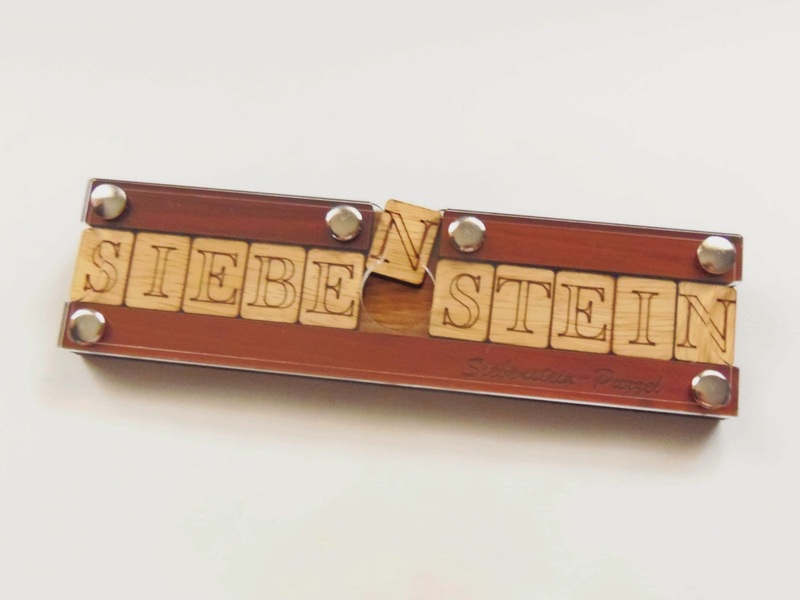 Siebenstein-Spiele usually combines wood and acrylic to make their puzzles extra shiny and elegant, also with various tones. In the case of the Siebenstein-Puzzel they only used two wood colors, enough to make a subtle, but enhanced visual effect. There are 11 pieces, each representing a letter of the company's name, and the goal is to rearrange the letters from any scrambled position to spell the correct name. The method is simply, but quite tough to master. There are three entry/exit points in the puzzle for the tiles to move. Actually, it's more like one exit point and two entry points. The open space in the middle is used to remove the tile directly below and when trying to solve the puzzle you should choose either the left or right entry points to place the tile. It's as simple as that. How hard could it be, right? In fact, it's quite challenging. The manufacturer classifies it as a level 6/7, so it involves some heavy thinking. Like any puzzle where your task is to rearrange the pieces, there's always some planning ahead before you make your moves. Like a simple sliding puzzle, you might need to mess up a small section of the puzzle before being able to fix it. This back and forth thinking is the logic behind the Siebenstein-Puzzel, or any other similar puzzle. Getting there, however, is easier said than done. Availability: The Siebenstein-Puzzel is available at Sloyd for €17.50. Brainstring has been a well known brand for many years, synonymous of fascination and curiosity. The way the puzzle is built and the infinite possibilities this apparently simple design is capable of is astonishing. 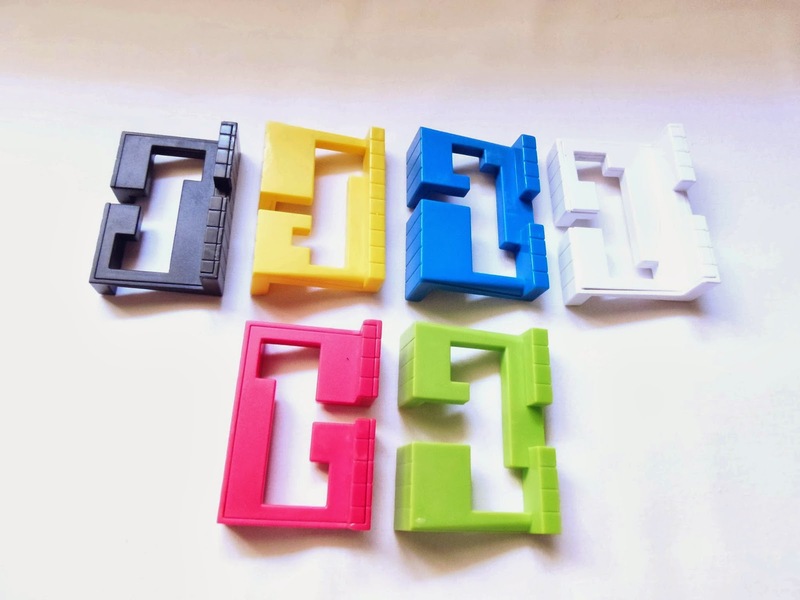 Following the success achieved by the Brainstring Original, Guido Lap, the inventor of the first version, collaborated with the famous puzzle designer Oskar van Deventer to come up with the Brainstring successor, the Brainstring Advanced. There are clearly some differences between the two puzzles, but some things remained the same, like the intricate mesh of strings, remarkably untangled, as they stretch from one end of the puzzle to the opposite side, as if defying logic. That's the most common characteristic between the two puzzles - So similar, and yet so different. Now, to the differences: First, the overall shape of both puzzles is what stands out immediately. 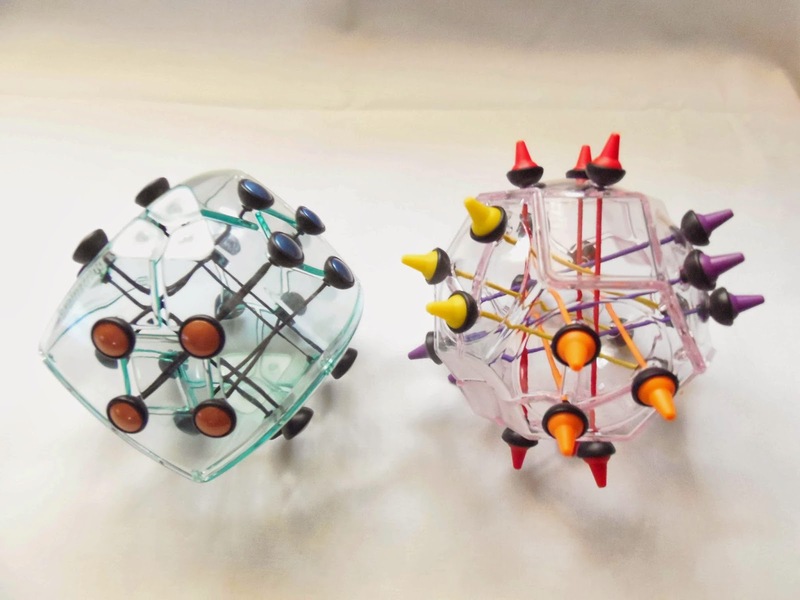 The first Brainstring was basically a cube, while the newer version is a truncated octahedron, which is visually more attractive. The number of total elastic strings is surprisingly the same, twelve, although the arrangement is different (three per face on the Advanced version and four per face on the Original version). Another welcome improvement over its predecessor is the inclusion of colored strings, which is easier to distinguish from inside the puzzle's transparent surface. The aspect of the pegs also took an overhaul, now looking more like a porcupine, adding a more stylish and bold visual effect. The goal hasn't changed either. Your task, or should I say tasks, is to move the pegs around the puzzle, making different patterns, while making sure to untangle all knots after you finish. When solved, the puzzle should have all strings as a straight line and not touching each other. 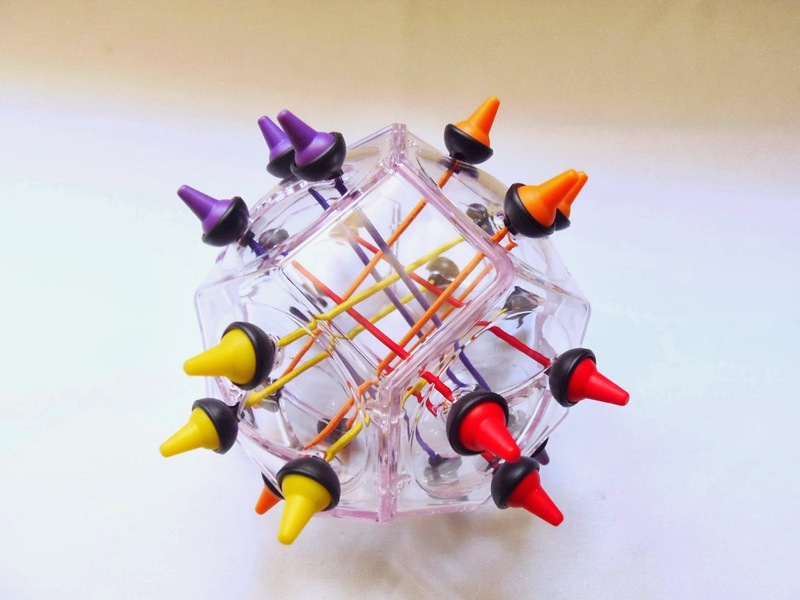 There are three main patterns you can attempt when solving the Brainstring Advanced, although you can create your own: The puzzle already comes solved in one of them, which is three of the same colored pegs on each face. You can revert to this pattern when you try any of the others. Another pattern is to have any three different colored pegs on each surface, and finally, any two of the same colored pegs on each surface. All patterns require you not to leave any entangled strings. I found the difficulty level between the two puzzles about the same. In other words, expect any of the two puzzles to be quite challenging, no matter which pattern you choose to solve first. When you first attempt to solve the puzzle, it looks quite confusing and it's hard to understand what you're supposed to do with the elastic strings. There are two opposite faces where the strings can cross paths, but there's no mention in the rules about how many strings you can maneuver at any given time. For that reason, take it as a clue that you can manipulate as many as you can handle. Be careful though, because it's very easy to lose track of the strings you have out of place and, before you know it, you'll have an entangled mess difficult to get out of. Start with two strings at a time, and as you gain confidence, you can add more strings to your juggling. The Brainstring Advanced is definitely a great improvement from the first version. 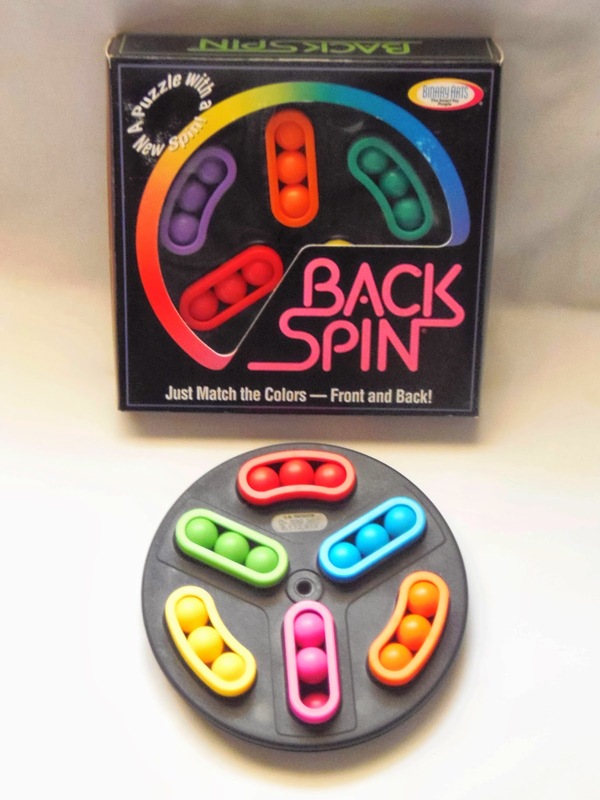 Its design is more attractive, but above all, it stayed true to the original concept - A fascinating puzzle like no other, perfect for the whole family to try. You won't regret it, that I can promise you. Availability: The Brainstring Advanced is available at PuzzlesdeIngenio.com, with worldwide shipping available. Jean Claude Constantin has the habit of designing pretty odd puzzles, many of them leaving us to think what to make of them. Schwungvoll (German for energetic/peppy) is one of those puzzles. 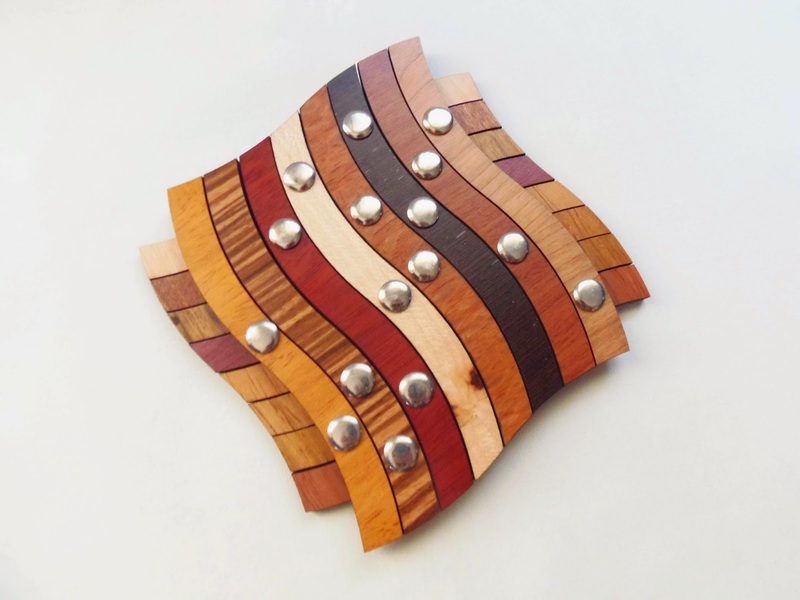 With a mesmerizing pattern of wavy and colorful wooden strips, the puzzle is quite intriguing - There's no clues as to how you should go about solving it. None whatsoever. The puzzle is comprised of 16 colored wooden strips. I want to believe all sixteen colors are different, but some of them look similar and are hard to distinguish between one another. Nevertheless, the effect is rather beautiful for a wooden puzzle. The puzzle is built in two sets of eight strips laid out perpendicular to each other. Each strip is attached to the bottom set ton two separate strips. Note that the screws form a different pattern in each strip with various lengths. The end result is that each strip, either the top set or the bottom set, has two screws along its length. The goal, as you might be suspecting by now, is to take the strips apart and then put them back together. Now, because the strips are so tightly bound together, there's hardly any room to move them back and forth. All you can do is move the strips a couple millimeters apart from each other, and that's because of the looseness in the screws, otherwise you'd think this wasn't a puzzle at all. I'm not even sure if the strips are supposed to come out separately or in groups of two or three. There's simply nothing in the puzzle that indicates one way or another. Schwungvoll is probably one of the hardest puzzles I've tried, unsuccessfully, to solve by Constantin. Its design is very attractive and elegant, but behind that pretty cover lies a puzzle so challenging it will baffle the most experienced puzzlers out there. I'd love to see this one taken apart, so if you happen to solve it, please let me know how you did it. 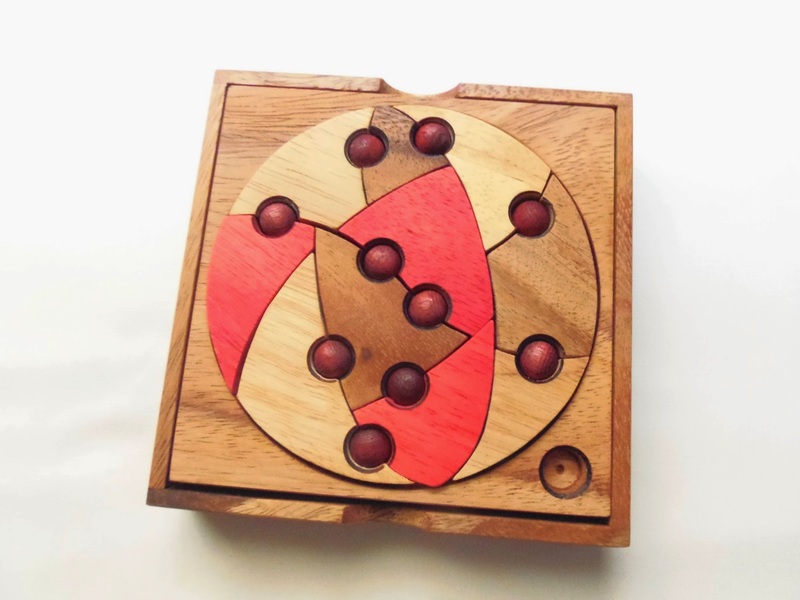 Availability: The Schwungvoll is available from PuzzleMaster for $31 CAD. You can also check out other great (and less challenging) puzzles by Constantin. Zig-Zag Knot is a very interesting interlocking puzzle designed by Ronald Kint-Bruynseels. If you played and solved the Gordian's Knot by ThinkFun, then you'll have no trouble tackling this newer variation, which is in my opinion a bit easier than its predecessor. The Zig-Zag Knot is also comprised of six interlocked pieces, but the design is different enough to provide a new experience. For example, the Gordian's Knot has a configuration that lets you see much better how the pieces interact with each other. In the Zig-Zag Knot, the pieces are tightly connected and it's much harder to see what's going on inside. The color scheme is also a bit different, but the idea remains the same, each piece has a different color. The goal is to slide the pieces in any direction and find the correct sequence of movements to free them all. There's only one way to do this and a million wrong ways. Can you find the right way? I always found interlocking puzzles a bit intimidating. Not because they're hard to take apart, but because most of the times they're much harder to put back together. I remember solving the Gordian's Knot a few years ago, and how difficult it was to solve and reassemble it, so it's understandable I was a bit apprehensive to try this newer version. To my surprise, the puzzle was actually easier to solve than I was expecting. There are a few reasons that might easily explain this, but ultimately, I found it even more fun and less frustrating than the Gordian's Knot. One of the main reasons for the easiness of the Zig-Zag Knot compared to the older version is the number of necessary moves to completely solve it. The Gordian's Knot needs a minimum of 69 moves, whereas the Zig-Zag Knot needs only about half of them. 37 to be more precise. Although you can't see much inside the puzzle, the difficulty level is still lower. Another reason could simply be that I'm much better now at solving puzzles than I was a few years ago. Either way, I strongly believe the Zig-Zag Knot is much easier to solve. The Zig-Zag Knot is a much bigger improvement over its predecessor. The design is more attractive and elegant, but the real important factor is that it's much more fun to play with. Even if you're not experienced at solving puzzles like these, I'm sure you'll love it. Availability: You can find the Zig-Zag Knot at PuzzlesdeIngenio.com. Worldwide shipping available. Smaz is a very well respected name in the puzzle community for his incredible Twisty puzzle designs. His real name is Li Chung Man and the amazing puzzle you see here is one of my favorites among his creations, the Dino Cylinder, first produced by MF8 in 2010. As the name suggests, this puzzle is based on the Dino Cube mechanism, while the solving process is closely related to the Rainbow Cube. Even though the Smaz Dino Cylinder has basically the same mechanism as the Dino Cube, it's actually much more challenging to solve. Why? 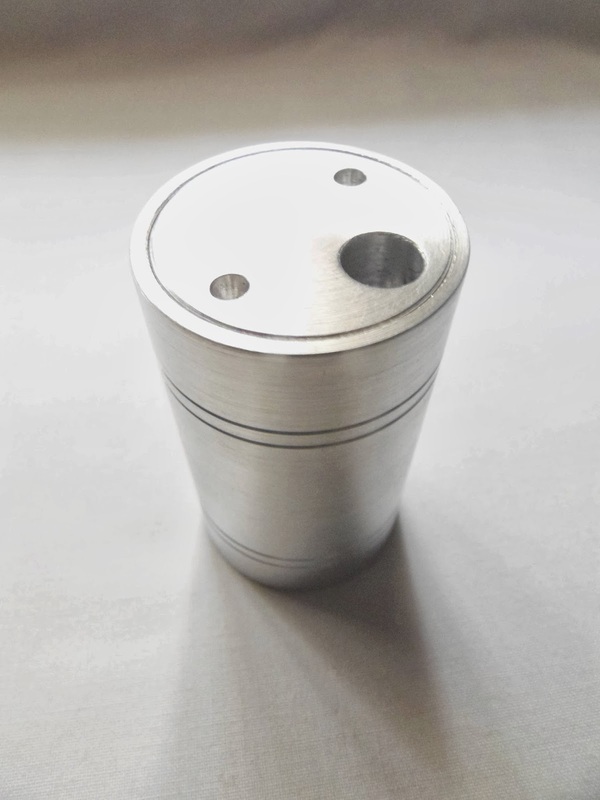 Simply because the Cylinder is a shape-sifting puzzle, therefore you not only have to solve by color, but also by shape. The design of the puzzle is stunning, with a set of unusual stickers that only cover the edges of the pieces. This actually has a purpose, which is to make the shiny black body stand out in contrast with the bright colors. There's also a white version available, but in my opinion not as striking as the black one. Surprisingly the Dino Cylinder is about the same size of the original Rubik's Cube, with a height and diameter of 5.7cm (2.2"). Solving the Dino Cylinder was a bit more challenging than I was expecting. To be honest, I'm not that good at solving Twisty puzzles, but I had previously solved Smaz's Dino Cube and thought it was easy, so the cylinder while being obviously harder, I didn't think it could be that much harder. 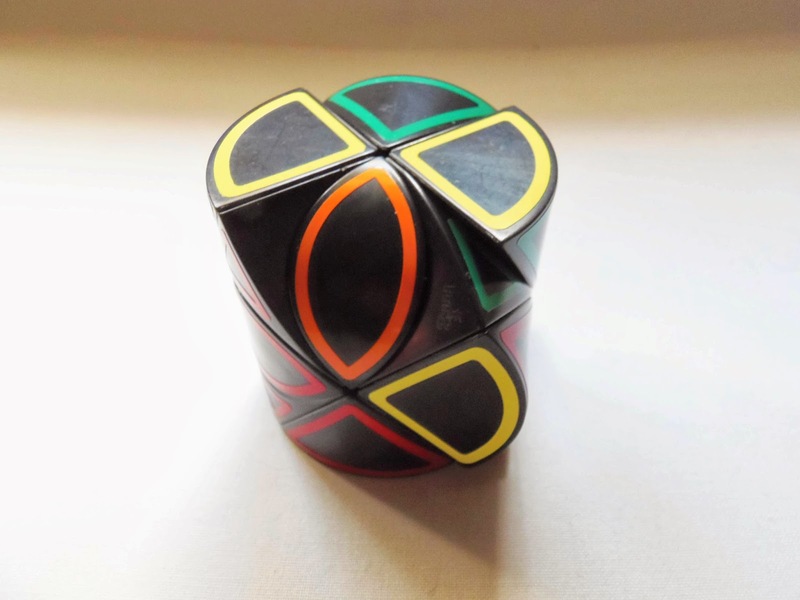 The Dino Cube can easily be solved by anyone without the need to learn algorithms, and even though this is also true for the Cylinder, not everyone can solve it without the help of a couple algorithms, especially if you end up with a parity problem. That's actually what happened to me and it took me several tries to get it back to its original form since I didn't had any algorithms memorized. Like any other difficult puzzle, it's quite rewarding and gives you a great sense of accomplishment when you finally see it solved. 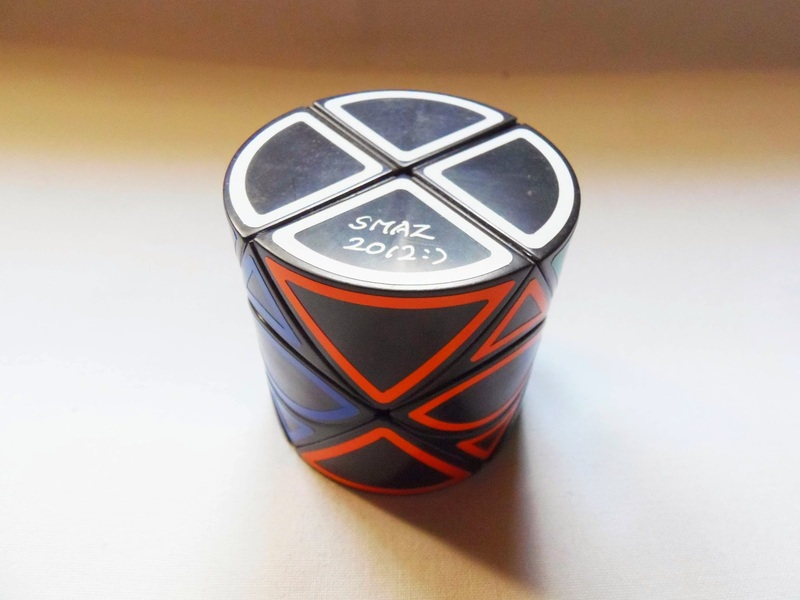 The Smaz Dino Cylinder is among my favorite Twisty puzzles, for its outstanding design and apparent simplicity on the surface, but deceptively hard once you get your hands on it. If you know how to solve the Rubik's Cube it can greatly help you by applying some of the same techniques and principles. I definitely recommend it to any Twisty aficionado. Availability: You can find the Smaz Dino Cylinder at PuzzlesdeIngenio.com. Sometimes, the simpler things are the best and the most beautiful - That's exactly what I feel about Vesa Timonen's Symmetrick. Made with only two similar wooden pieces - Emphasis on similar, not identical - solving this puzzle will be anything but simple. The Symmetrick might be one of Vesa's greatest achievements in puzzle design, and already owning many of his incredible puzzles, that says a lot about this one. The Symmetrick was Tomas Lindén's Exchange Puzzle at the 32nd IPP in Washington D.C., held in 2012. These two designers come from Finland and have collaborated in the past in what I consider one of the hardest puzzles I ever tried to solve, the Double Squared - Yes, I gave up on it and had to look up the solution. Now, I've had this puzzle probably for about a year - No, it didn't take me that long to solve it. The reason it took me so long to pick it up and try to solve it was exactly for the reasons stated above...that fiendish puzzle... I was just afraid it was going to take forever, again, to solve it like the other one. So, I was always delaying its review until I had the courage to tackle it and be done with it. That happened this week. Fortunately, my fears were unfounded. At first, it was a bit difficult. The fact that both pieces have slightly different shapes is a little confusing, to say the least. My initial efforts were all unsuccessful as I merely joined the pieces at obvious spots. I knew the symmetrical shape would be something much more complex than a simple rectangle or trapezium or something. So, after 15 or 20 minutes I started with another strategy. This might contain minor spoilers: with the pieces joined at a given edge I'd started sliding the pieces slowly along that edge and see if I could spot any symmetrical shape or something closely resembling one. It took me probably another 5 or 10 minutes, but I finally discovered the solution. All I can say is that, you won't probably recognize it as a symmetrical shape right away, but don't dismiss it immediately. To my knowledge, only one line of symmetry is possible on the solution. Take some time to analyse the shapes you'll be creating and you'll eventually find it. I'm just glad it didn't take me forever. Vesa's Symmetrick puzzle is superb, incredible and anything in between. It's definitely a hard puzzle, but not frustratingly hard. I know that some people will still find it frustrating. I know I was intimidated by it, and it's the designer's fault for designing some of the hardest puzzles around, but the Symmetrick is just not one of them. The solution is very elegant and I'm sure you'll love it as well. Availability: You can get a copy of the Symmetrick puzzle at Sloyd for just €7. Update: My puzzle friend Dimiter came up with a clever analysis for the Symmetrick puzzle and was able to solve it without resorting to simple trial and error. You can get a clue with the picture below left. Notice the lines marked denoting two different sized triangles. 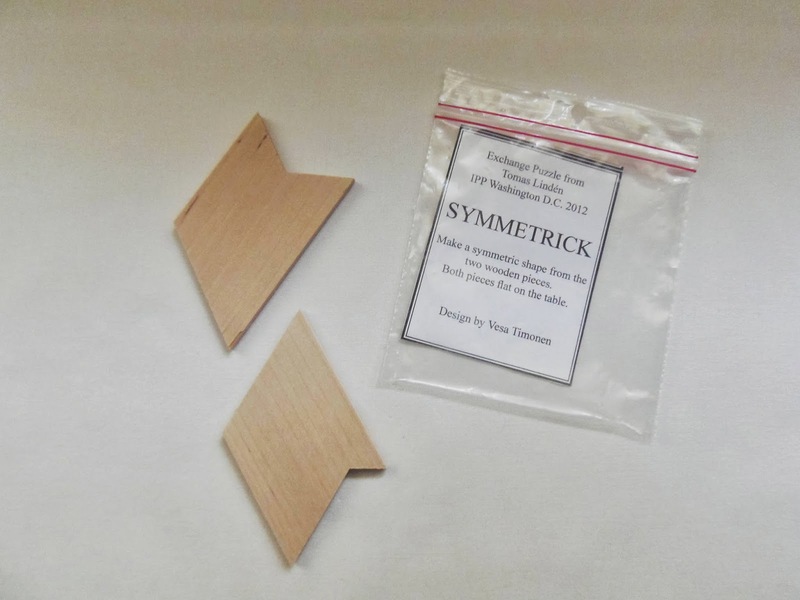 Dimiter also came up with a new puzzle, based on the same principle as the Symmetrick, but instead of using two pieces, you now have to make a symmetric shape with three pieces. See picture below on the right. Let me know in the comments or e-mail me if you can solve it. Jean Claude Constantin has made quite some interesting trick boxes before, of which I own several in my ever-growing collection. However, the 20 Cent Box tops all of the previous ones, at least the ones I tried. The trick involved to solve this puzzle is so clever it requires some serious thinking outside the box. Be prepared for some cursing and a lot of frustration. The goal of the 20 Cent Box looks simple enough, but after taking a good look at it, you will probably start doubting it, like I did too. On the site, it's clearly stated as the object of the puzzle to "open the box". However, the description gives room for other interpretations as well. It's also said to solve the puzzle to "retrieve the coin". Is it possible to retrieve the coin without opening the box? That was exactly one of my thoughts after I had already spent a shameful amount of time with the puzzle. I kept wondering if it was possible that dexterity could play a big part in solving the puzzle. I noticed that the provided key could be inserted into its corresponding slot all the way into the distance of the coin slot. 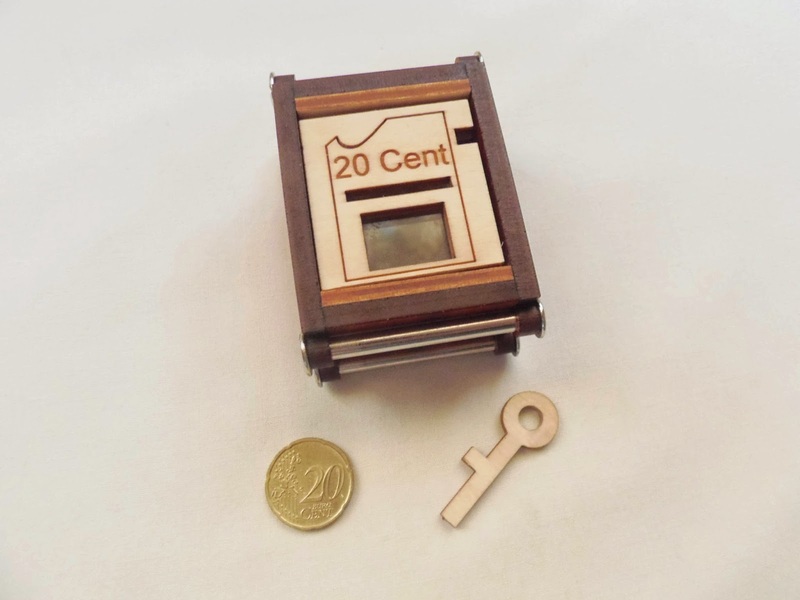 In other words, if you flipped the box with the key slot facing down and you could somehow manage to balance the coin on the tip of the key (the key tip is about 3mm flat), you could almost get the coin out of the coin slot. I actually got close a few times, but could never quite get it out, short of a millimeter or two. This wasn't most certainly the way to go, so here I was without any more ideas. I had tried pressing on different spots on the box, see if something would slide. I had study it from every possible angle, but nothing seemed to work. The only thing that kept me intrigued was the small hole at the top, which was enough for part of the key to go through, but the bit on the key wouldn't let go any farther. The key seemed useless, but the hole looked too out of place to be just a red herring. I won't describe the solution any further, because I reckon it will be worth it for you to discover it by yourself. I believe what I described above is enough for you to make an educated guess on how to proceed. 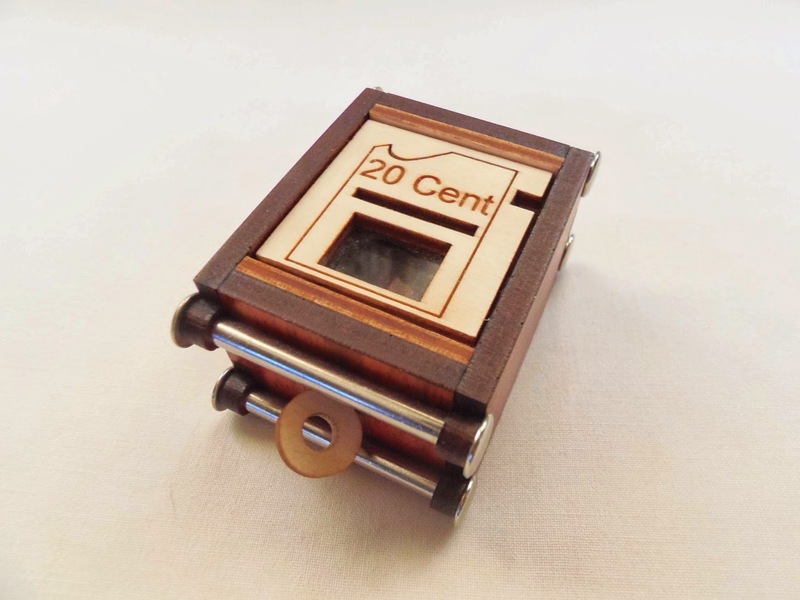 Constantin's 20 Cent Box is now one of my favorites trick boxes. It's won't require a sequence of movements like the ones used in other boxes, but a combination of things instead. It will surely leave you a smile on your face when you finally get it. If you have one and already managed to solve it, I'd love to hear from you and how you got there. Highly recommended for fans of trick boxes. Availability: You can get a copy of the 20 Cent Box at PuzzleMaster for $28 CAD. Other designs by Constantin are also available. Geranium is one of the most fascinating Rotational/Rearrangement puzzles in years. It's as hard as it looks, and with reason, since it will require a courageous mind to get it completely mixed and solved. The puzzle was designed by Leslie Le and it was released by VeryPuzzle in June 2013. A good way to describe the Geranium puzzle is as if it was a Twisty puzzle flattened into a 2D surface. The logic and techniques you use on Twisty puzzles will surely be very useful here, to understand the movement and permutations between the five intersecting circles. Built with a mixture of materials, such as ABS, PVC and Stainless Steel, the puzzle looks gorgeous with a slick and elegant design. The transparent frame covers much of the top surface, and you can only rotate the edges of the circles. The movement is smooth, but you need to ensure the circles are well aligned or they won't move at all. One of the most famous puzzles in the Intersecting Circles category is the Hungarian Rings. In it, you only have two intersecting rings that share two common points where the beads can be shifted from one ring to another. If I were to classify the difficulty levels of both puzzles, I'd say the Hungarian Rings would be a 1/10 and the Geranium puzzle would be a 10/10. That should give you an idea of how complex and difficult this puzzle is. 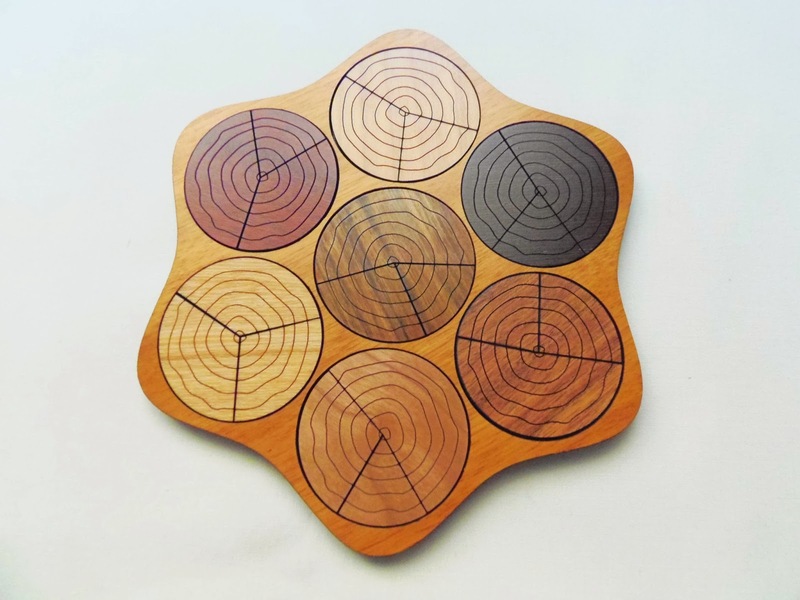 As mentioned above, the Geranium puzzle consists of five intersecting circles with 25 pieces of various sizes and shapes, although each circle shares many pieces with other circles. However, among all the pieces, there's only one that's shared by all the five circles, a pentagon-shaped piece. The colors are distributed around as a half-moon shape, with each circle also sporting all five colors in different amounts. The goal, like any other in this category, is to simply mix it and then return it to its original pattern. As you mix the puzzle, the color distribution will vary, depending on which circles you rotate at any given time. Every time you rotate a circle you'll block certain movements in the process due to the different shapes of the pieces, preventing other circles from moving afterwards. It's up to you to evaluate and study which circle to move, anticipating which moves will be subsequently blocked. Conversely, when you have a blocked circle and you need to rotate it, you need to understand which other circles you need to move in order for it to be unblocked. It's this constant block/unblock moves that makes the puzzle so difficult. So far, I only had the courage to partially mix it and return it to the start, which was already pretty scary. Nevertheless, if you're confident enough at solving any complex Twisty puzzle, then I'm sure you won't have any problems with the Geranium. The Geranium puzzle is such an original design it's hard to find a similar one in the market, and an equally difficult one for that matter. The colors and shapes in the puzzle provide a beautiful visual effect that will even captivate the attention of the most distracted puzzlers. Availability: You can find the Geranium puzzle at PuzzlesdeIngenio.com for €40. 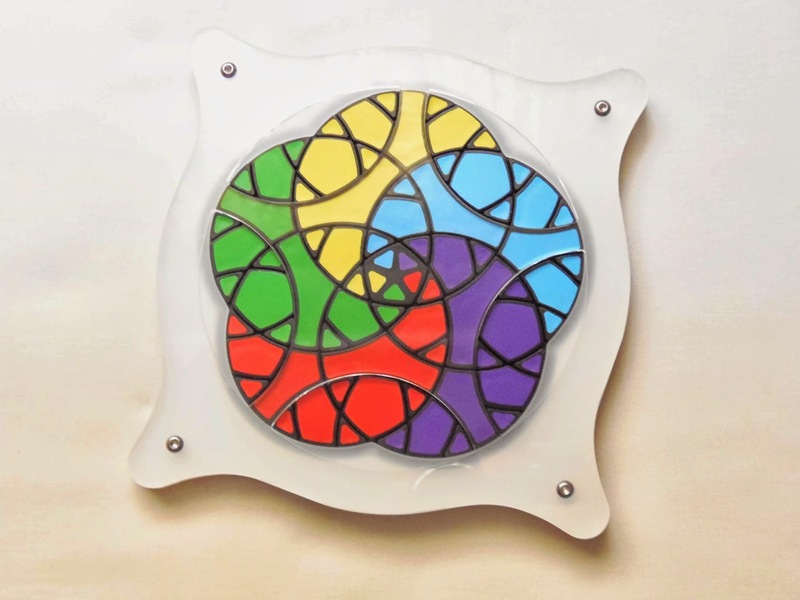 The puzzle is visually very attractive, made with bright colors and a simple mechanism that is easy to understand and, most importantly, easy to solve. The size is also rather big which is nice, measuring about 15.5cm (6.1"). The movement is smooth and unrestricted, making the experience fun and enjoyable. This concept isn't exactly unique, as you might have seen in other two-layer UFO-type puzzles, but it was enough to inspire other designs and imitations. It consists of 35 colored balls spread across 12 areas. Each area has its correspondent color, although three of them are identical in both front and back - There's only 9 different colors. 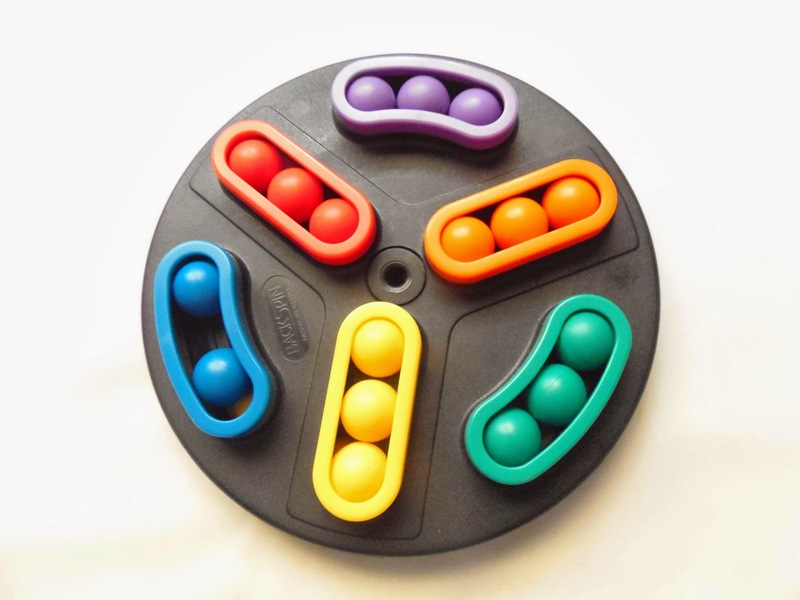 Since there's room for 36 balls but only 35 are available this creates a hole and thus, making it possible to mix the puzzle with different colored balls per area. The goal is to scramble the puzzle as much as you can - Try to put three different colors per area - and then place all balls into the same colored area. 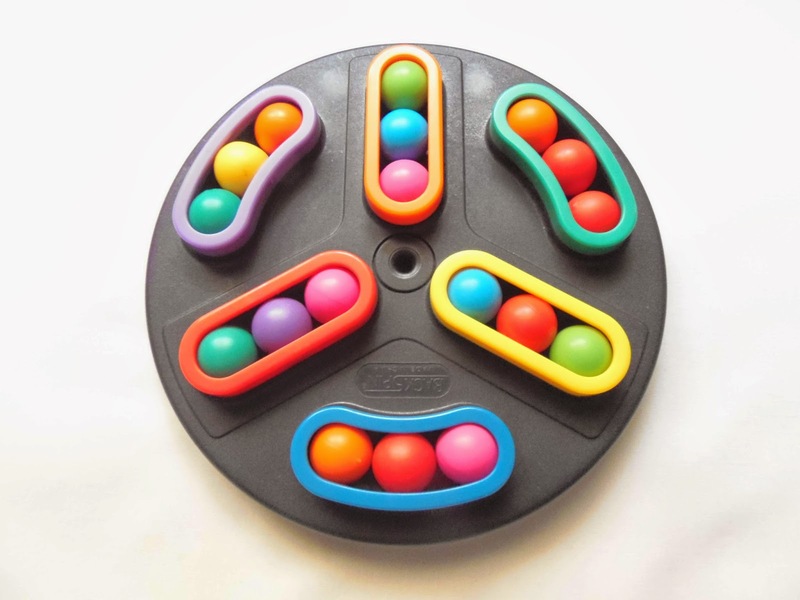 You mix the puzzle by rotating the two discs back and forth and using the free space to exchange the balls' positions. I found that mixing the puzzle is as fun as solving it. At first, my goal was to do what I mentioned above, to have three different colored balls per area. That was accomplished quite easily, so I immediately attempted to solve it. Even it took more time to sort through all the balls, the difficulty was pretty much the same. The puzzle has two types of areas, straight and curved, but you can freely exchange balls between them without any restrictions. This was exactly why I liked it so much. It's neither an intimidating puzzle, nor a frustrating one. It's just plain fun to play with. Availability: The Backspin puzzle is harder to come by these days. You can still get a copy at Sloyd for about €20. Jahresringe, by Jean Claude Constantin, is an interesting-looking and colorful packing puzzle unlike anything I've ever seen. 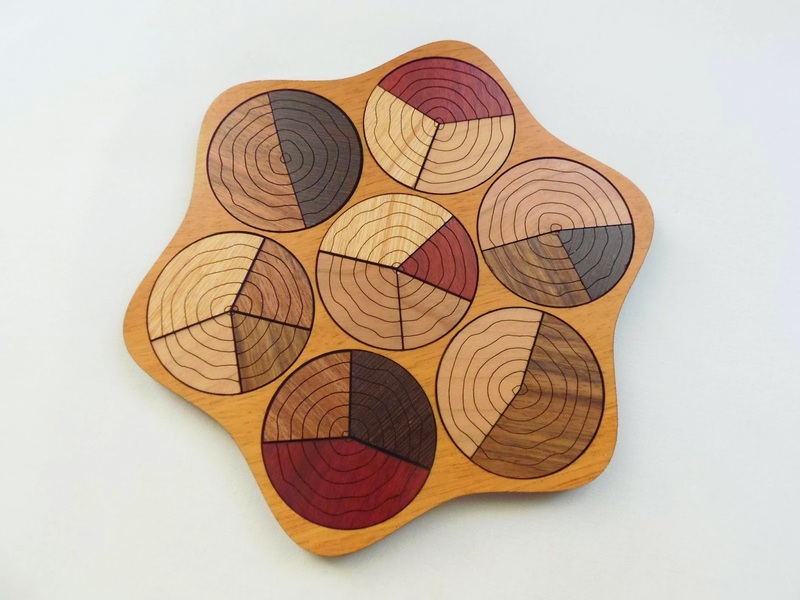 The design of the puzzle begs for attention, as the seven disks, each with a distinct color, look mesmerizing with a ring pattern reminiscent to a cross section of a tree - Hence the name Jahresringe (year rings). 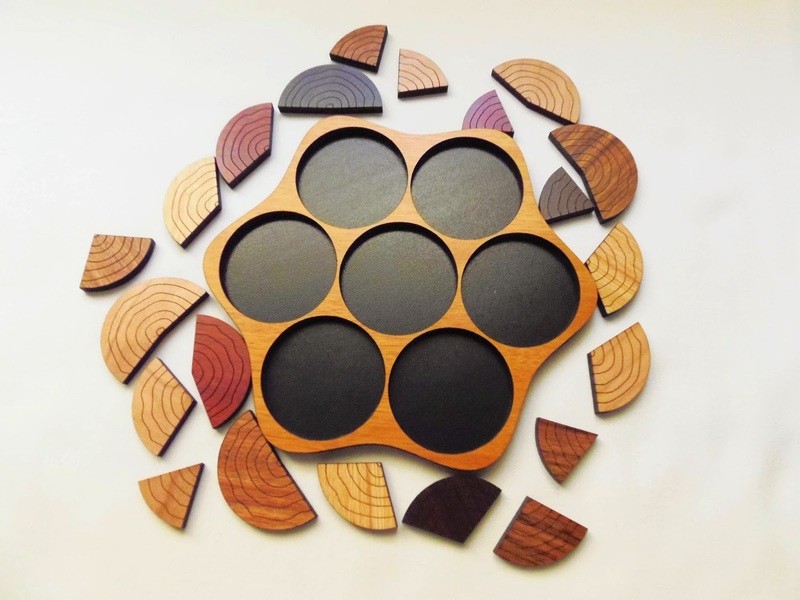 The puzzle, consisting of seven circles spread across the wooden tray, is neatly packed with three pieces per circle. What you see when you first pick up the puzzle is a simple pattern of three of the same colored pieces per circle - That's the easy part, which is hardly a challenge. The tough part, as it is described, is to get three different colored pieces per circle. Surprisingly, this puzzle is a lot tougher than I initially made it out to be. It's considered a level 7/10 by PuzzleMaster, but after trying dozens of different configurations I'm still at a loss. I can't figure out this puzzle. There's no mention in the description as to other possible solutions, other than three different colors per circle, but coincidentally, the only one I found so far other than the same colored pieces per circle is a mixture of two, three and even four colored pieces per circle (see below). Now, I'm not sure what to think of this puzzle. Either something was lost in translation, and it's quite possible, or I'm simply out of shape for packing puzzles at the moment. I discovered the mixed solution almost by accident, when I noticed there were two large pieces that could fit perfectly into a circle. After some more fiddling with the pieces I got another circle with two pieces and started to wonder about the rest of the circles. Since there already two circles with only two pieces each, there must at least two other circles with four pieces, to compensate for the two missing ones...And indeed I found those configurations. Now all I had left was three circles and nine pieces. It wasn't too difficult to fill the remaining circles afterwards, and the result can be seen above. I'm still unsure about the 'three different pieces per circle' solution. I just can't find, but it doesn't mean it's not a possible solution. If it's possible, then I reckon the puzzle is much harder than a level 7/10. Jahresringe is, without a doubt, a very clever design and quite an original concept - What else is knew for a Constantin puzzle... Featuring different wood colors in his designs is again put to a good use, as the visual effect is rather stunning. If you have this puzzle and found the supposed main solution, please do let me know. Availability: You can buy a copy of the Jahresringe puzzle at PuzzleMaster for $21.99 USD. You can also browse dozens of other interesting designs by Constantin. Square Fit is one of the most deceptively hard puzzles I know. The design is made so it challenges anyone to try it and yet, only the most persistent ones will be able to solve it. Designed by Bill Cutler, who curiously claims this to be his best puzzle. Feeling confident enough to try it? 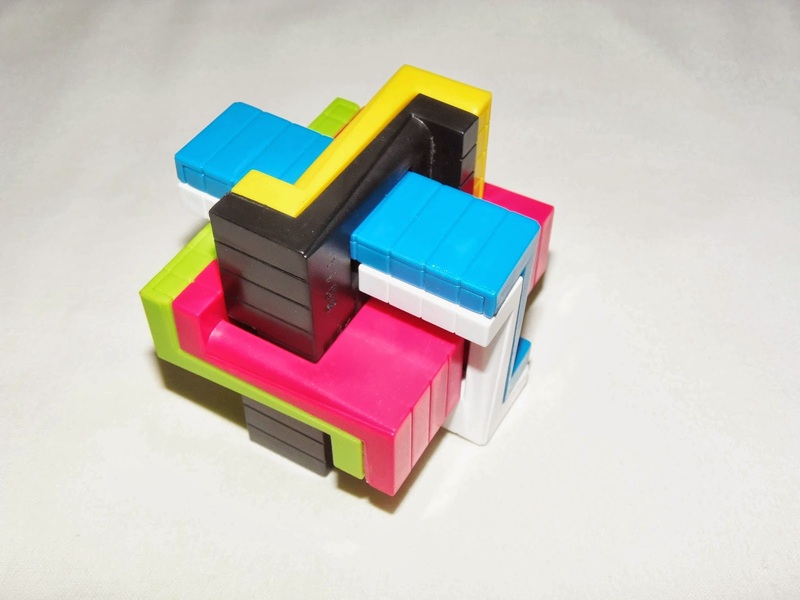 ThinkFun's version of Square Fit was made for their a-ha! series, which consists of several challenging puzzles for the more experienced puzzler. The original was made from wood, but following ThinkFun's tradition, you're presented with a beautiful design with bright colors and, like the others, in a small size, which is perfect to take with you on your long travels. What strikes me as most fascinating in the puzzle is its simplicity and apparent easiness. 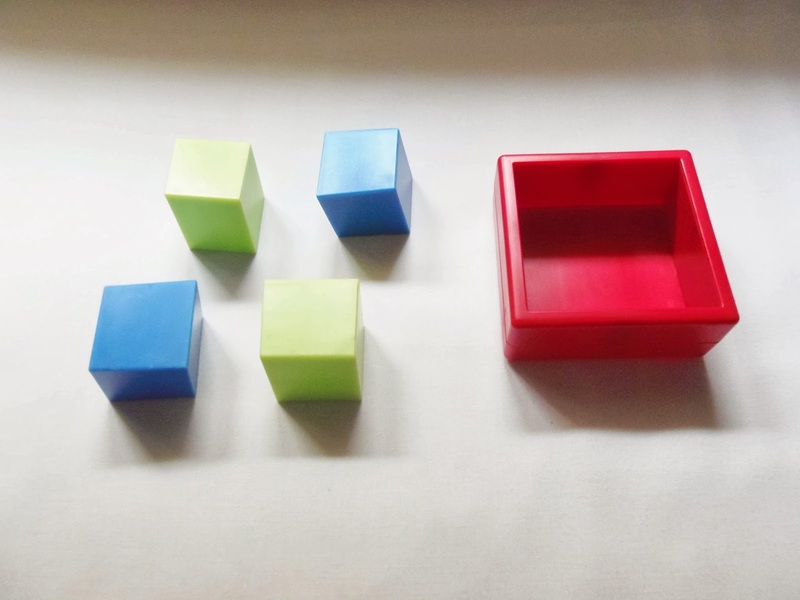 Comprised of four identical pieces, Square Fit only needs you to place those pieces in the tray. There's a catch, though. Both the pieces and the tray are irregularly shaped, with each piece side having a different sized quadrilateral. Even with only four pieces, there are many wrong arrangements and only one is correct. Finding it won't be a walk in the park. Solving the puzzle was quite difficult, but still not overly frustrating. I didn't have any particular strategy, so trial and error as I was examining the pieces was my only option. I did notice that as you place each piece in the tray, there's a position in with the piece fits exactly with the contours of the tray. You can take this as a sign that you're in the right path, so you just need to find where each piece belongs. Once you accomplish that you still need to insert all the pieces at the same time in the tray, due to their irregular shapes. When you solve it, you can try to remove just one piece and see it for yourself. It's just not possible. You also need to remove all four of them at the same time. Bill Cutler's Square Fit is indeed a fantastic puzzle. It has everything an enthusiast appreciates in a puzzle: a great design, deceptively challenging and fun to play with. And perhaps he's right. This might be his best puzzle ever. 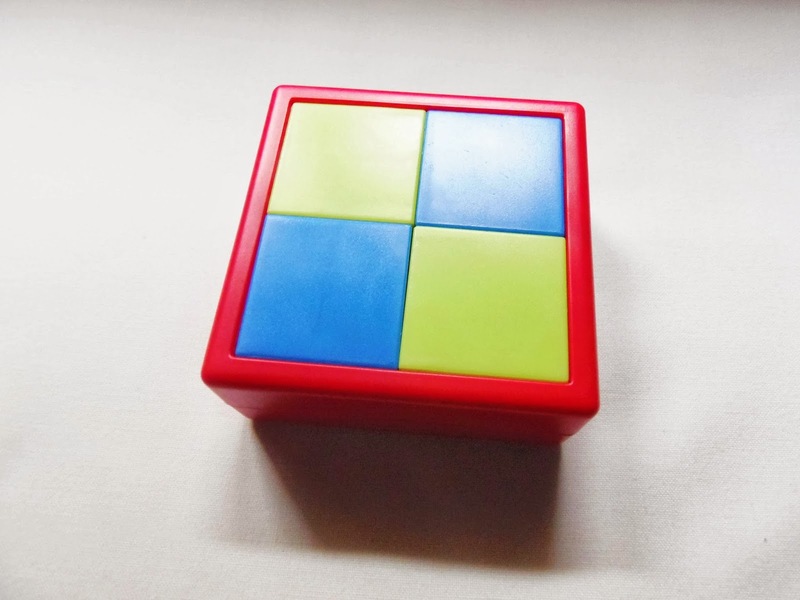 Availability: ThinkFun's Square Fit is available at PuzzlesdeIngenio.com for just €6.90. 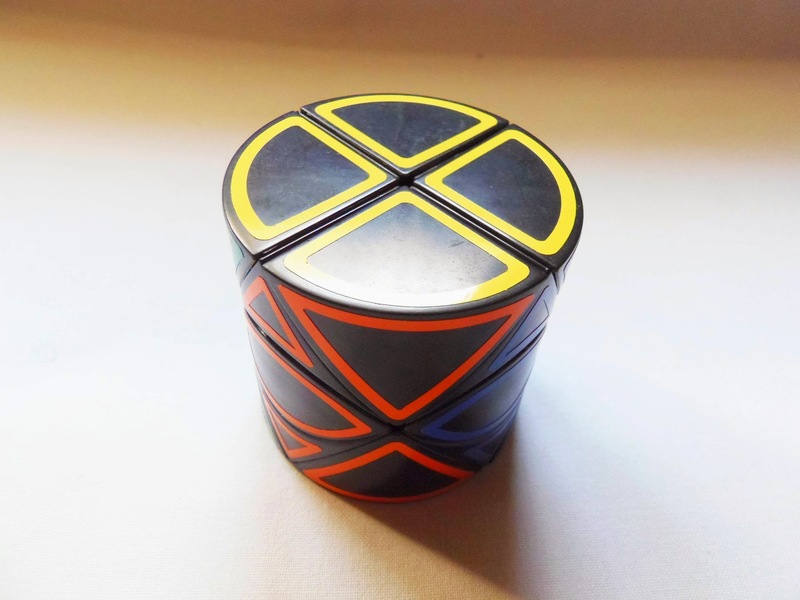 About a year ago, I reviewed the first puzzle designed by my fellow blogger and puzzler Jerry Loo, the Ball in Cylinder #1. The result was a really nice surprise, considering how little experience he had at designing and manufacturing puzzles. The BIC #1 was a superb puzzle, so Jerry had his work cut out for him if he wanted to succeed with his second design. In my opinion, not only he succeeded, but he also outdone himself. Like the first BIC, the BIC #2 is exactly the same size as its predecessor. There are, however, a couple of subtle differences on the outside, but the biggest one is hidden from view, which is the inner mechanism, this time ten times more complex than the first - At least that's my interpretation. First, the appearance: The more apparent difference is the location of the hole where the ball exits, which sits closer to the edge instead of the center. The other, more subtle, difference is the number of lines found at both ends on the side of the cylinder, where the BIC #2 is sporting two pairs of lines while the first BIC had only one at each end. Now, the most important difference between the two BICs lies in the mechanism itself, and here is where everything gets complicated. 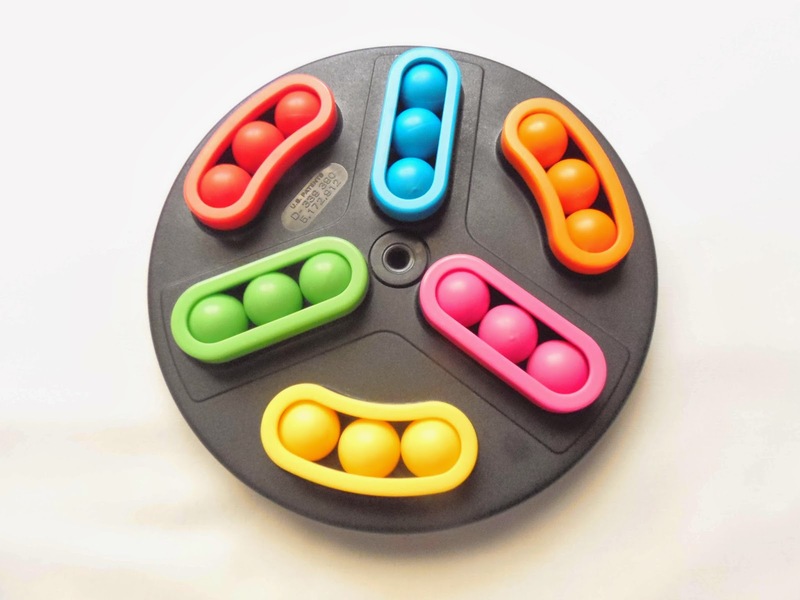 The goal is basically the same on the two puzzles: find the correct sequence of moves that enables you to remove the small ball bearing trapped inside. The way you do that, however, couldn't be more distinct between the two puzzles. What still has me confused after all this time is the fact that you can actually see a small part of the mechanism through the exit hole. Besides the large ball bearing that's visible at all times and only moves back and forth in one direction, you can also see that small part sliding in the same direction directly below the ball, but I haven't found out what exactly is its use. 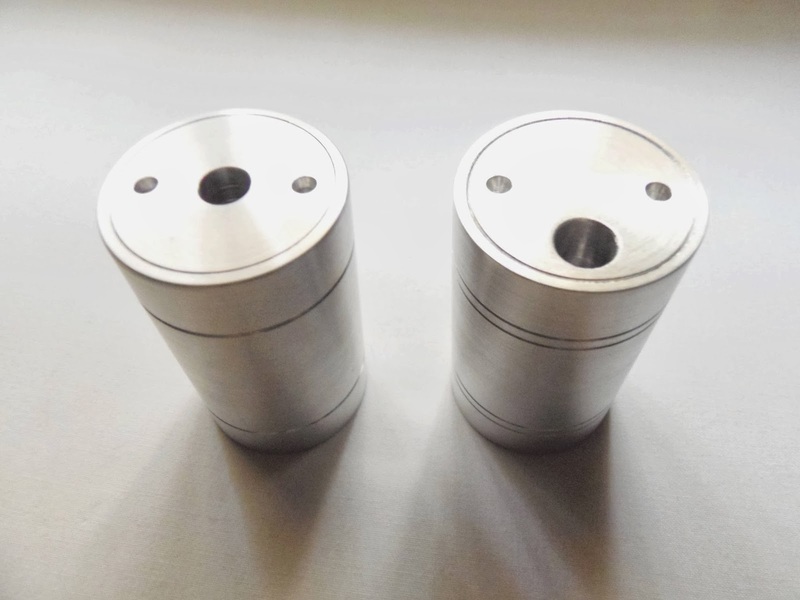 Since the large ball bearing isn't going anywhere and it's too large to exit through the hole, there should be another ball bearing inside, a smaller one. In fact, you can easily hear it moving inside the cylinder, but it only moves from one end to the other without coming into the exit path where the larger ball is. That's actually another problem you need to worry about once you manage to get the small ball bearing visible, as you might get it behind the large one, which is blocking its exit. I still haven't managed to do that, let alone solve it. I could've asked Jerry for some tips by now, but in doing so I would be admitting defeat, and I'm not giving up on it...yet... We'll see how far my patience gets. Despite not being able to solve Jerry's BIC #2 in time for the review - I could've simply waited until I had it solved, but that could take months - I can still appreciate it for the complexity achieved and the improvement from the first design. As for what's next, I can only imagine how Jerry will improve on his previous ideas. Availability: BIC #2 is currently sold out, but you can contact Jerry through his profile page and be added to his waiting list for the next batch. In a market oversaturated with too much similar concepts and variations, it's always a welcome sight when something completely new and fresh comes along. Rainbow Nautilus, designed by Tim Selkirk and manufactured by Meffert's, is one of the most beautiful Twisty puzzles I've had the pleasure to play with in a long while. The seashell-shaped Rainbow Nautilus is quite different from what you're used to see in Twisty puzzles. The shape, the first thing you notice is rather fascinating. It's a 3x7 (three layers and seven wedges per layer), but classifying it just like that would be an understatement. Because of its unusual shape, some of the pieces are bandaged - meaning some moves are blocked at certain positions - and need to be correctly aligned to be rotated. Being a bandaged puzzle, scrambling it is already hard enough, but solving it is a whole different matter. And because the puzzle is so unique, there's not much to compare it to. As many of you know by now, I don't review many Twisty puzzles. Not because I don't like them - I really do - but simply because I'm not very good at solving them. Since I'm not an authority on the subject, I tend to stay away from reviewing them, especially the most complex ones. I just couldn't resist to the Nautilus. It's a puzzle that every collector should have in his collection, even if it's not meant for solving. The Nautilus has been compared to the classic Square-1, another bandaged puzzle, and another pain to solve - Something I've never quite achieved. For that reason it shouldn't come as a shock that I haven't been able to solve this one as well. I did scramble it partially, but couldn't go forward to do it completely. I know my limits and I know the puzzle is indeed very difficult to solve, even for the more experienced. I just rather have it in its glorious form for the time being. 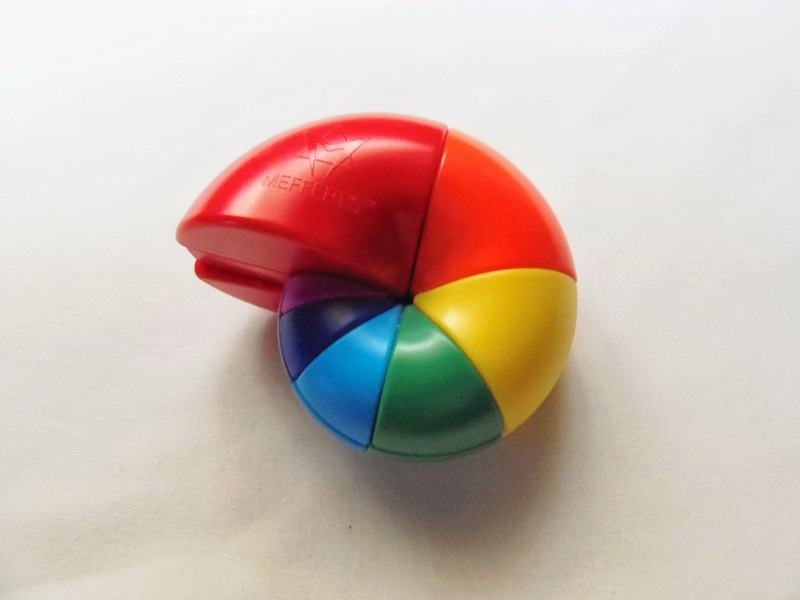 I recommend the Rainbow Nautilus to anyone, even if you don't usually play with Twisty puzzles. Its design is so extraordinary and original it'll be a while before something so fascinating like it will appear on the market again. Be warned though, this is not an easy puzzle to solve by any means. 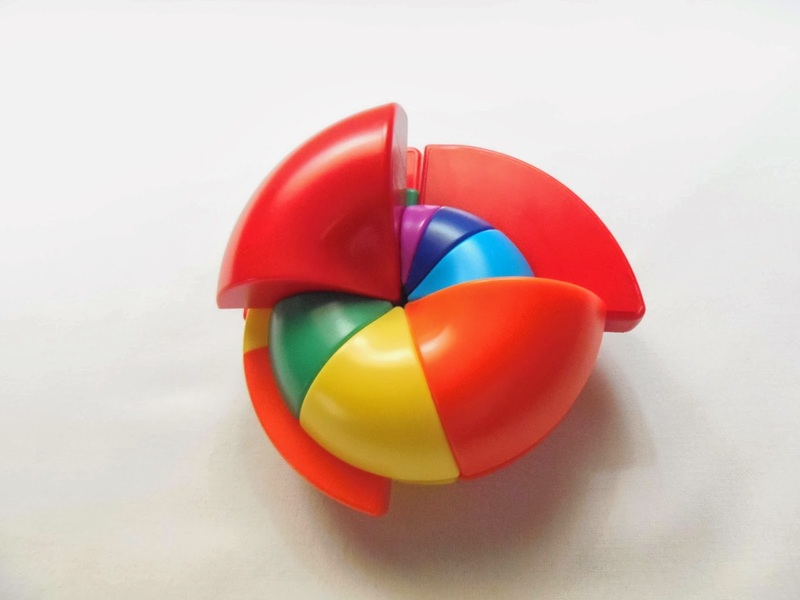 Availability: You can buy the Rainbow Nautilus at PuzzleMaster for $20 CAD. For other Meffert's puzzles, check out this link. What I love about packing puzzles and makes them one of my favorite types of puzzles is the countless concepts and ideas out there. There's always something new to experience, whether you prefer 2D or 3D packing puzzles. Personally, I prefer the two dimension ones, mainly because some of my favorites are 2D puzzles as well. I believe there's more room for creativity with 2D. I could be wrong, but that's how I feel. Cookie, designed by Jürg von Känel (thanks for this info, George), is a great example of a creative design. You might have seen similar concepts where you need to add an extra piece to the already (apparently) solved puzzle. Cookie is slightly different though. You not only have to worry about adding the extra piece, but you also need to rearrange the pieces around the frame so all the holes can accommodate all ten chocolate chips. The puzzle is beautifully made in three different colored pieces, plus the round chocolate chips, which look real enough to be thinking about eating chocolate afterwards. With a diameter of 14cm (5.5"), the puzzle is large enough to provide a satisfying experience, and the cover serves as a box to store the puzzle and prevents the pieces from getting lost. As for the challenge itself, I reckon seasoned puzzlers won't be too happy with this one, because the puzzle is very easy. As soon as I looked at it with the intent to solve it I immediately found the solution, which baffled me. The concept looks so interesting, and yet the solution is so simple it deeply disappoints. I only had to flip three pieces and it was solved in seconds. Now, my first thought was that the arrangement of the pieces was wrong and the solution should be more concealed. However, after messing with the pieces for a while I couldn't rearrange them good enough to make the solution less obvious. Each piece is different and belongs in a specific place in the tray. Excluding mirror images, there's just no way to make this puzzle more challenging. 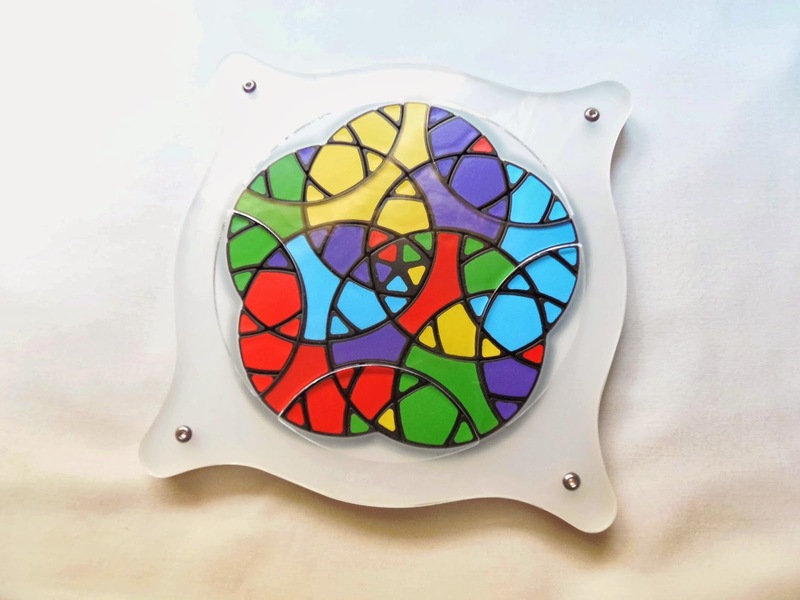 Cookie is indeed an interesting puzzle and features an elegant design. But that's not good enough. The challenge factor simply isn't there. Unless you're not used to this type of puzzles or you're a collector, like me, there's not much in it for me to recommend it, unfortunately. You be the judge. Availability: You can get a copy of the Cookie puzzle at Brilliant Puzzles for about $13 USD. Update: Apparently, there's indeed a less obvious configuration for the pieces that makes the puzzle a little more challenging than I originally thought. See this link, where it shows how the pieces should be presented initially. Thanks George!